New "Top Gear" host Chris Evans owns an extensive car collection. 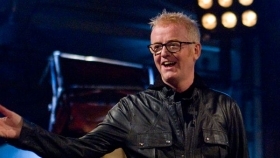 LONDON (Reuters) -- Television and radio presenter Chris Evans is to become the new host of Britain's globally popular “Top Gear” TV show, replacing Jeremy Clarkson, who was dropped by the BBC in March after he attacked a producer. Evans has signed a three-year deal to lead the show which is aired in more than 200 countries and watched by 350 million viewers worldwide. Filming will begin in a few weeks’ time, the BBC said, without Clarkson's co-hosts Richard Hammond and James May. Evans, 49, who owns a multimillion-dollar car collection and has a penchant for Ferraris, said he was thrilled to get the job in his "favorite program of all time." "I promise I will do everything I possibly can to respect what has gone on before and take the show forward," Evans said, adding he would continue to work as a radio DJ for the BBC as well. Evans, who had ruled himself of hosting the show back in March, is a friend of 55-year-old Clarkson, whose strong opinions and off-color remarks generated both complaints and profits for Britain's publicly funded broadcaster. Evans too has endured negative headlines. Prominent in the 1990s, Evans’ humor sometimes landed him in trouble. He quit the Radio 1 show in 1997 after the BBC refused to give him Fridays off work. Evans has reinvented himself in recent years as a more reliable host, returning to TV and enjoying a successful spell presenting the BBC's Radio 2 breakfast show since 2010. “Top Gear” is syndicated around the world and is one of the BBC's most successful and lucrative programs, generating overseas sales worth $80 million a year.